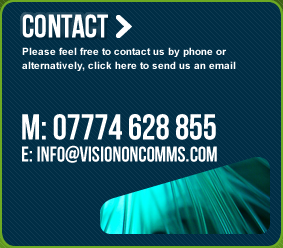 Click to view testimonial video We found Vision On Communications friendly, easy to work with and highly professional. They got right to the nub of what we wanted to say and turned into a simple, moving and highly effective corporate DVD. We also used Vision On to produce a web news report for our high profile Philanthropy Forecast event in which Cathy interviewed Tim Smit and Dame Stephanie Shirley, creating a news report which summed up our event and provided an effective marketing tool. Click to view testimonial video TShirt Studio have a highly visual product which lends itself to moving pictures, so it was an obvious move to get some video to demonstrate the style and fit of our garment ranges. We are sure that video will become essential to web marketing, and right now there's an opportunity to be among the first wave of companies to start developing visual identity and marketing strategy on the web with moving images. We're confident that the delivery technology is mature enough, and that our mass market audience is comfortable with video on the internet. It was essential that we came away with a visually exciting and inspiring video, and that production quality was top notch. It was immediately clear that Vision On had the experience and creativity to provide the very best in terms of quality, and that their ideas would resonate with our audience. We have got a product we are more than happy with at a price that represents very good value for money. I would not hesitate to recommend Vision On Communications to anyone looking for creative, quality web video. Vision On Communications is a fantastic company which has helped our press/pr activity at Well Hung Meat enormously. The team is great to work with and quickly understood the importance of conveying what we do through media outlets to the public at large. We have wonderful home grown products and wanted to let people know where our meat comes from and how it's reared. Vision On are capable, efficient and had a wealth of ideas about how to do this. We will be using them again in the future. I knew Cathy Sayers, Director of Vision On Communications, when she was Features Editor at ITV for Westcountry Live and then The West Country Tonight. In that time she presided over some remarkable high quality features. A big picture thinker she also had the attention to detail needed in the heavily regulated world of television news. She had the ability to harness resources available to her in the most effective way possible. She came up with ideas and creative ways of filming to match the subject matter. She put interviewees immediately at ease and knew how to get the best out of them. She had good knowledge of new media and set and met the tightest of deadlines. She was always energetic, enthusiastic and efficient. She was a first class ambassador for ITV, much loved by her colleagues.